Rani Devi, 47, is drying chickpea (chanaa daal) in Kuite Khera village of Uttar Pradesh. 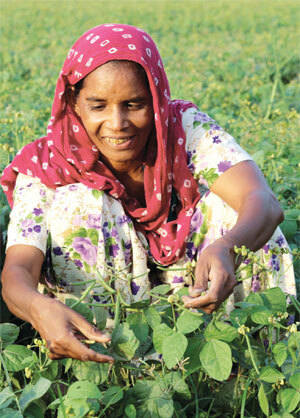 She intends to use them as seeds in the coming rabi season (October to December), as she is facing acute shortage of seeds. “I had kept these for consumption but will now use them as seeds,” says Rani. “We neither get quality seeds from the government nor from the market and these seeds are our last hope,” she adds. Rani is not alone. Thousands of farmers across India are facing crop loss and seed deficit even as prices hit the roof. India is the world’s largest pulse producing, consuming and importing country. Far away, in the African country of Malawi, pulse growers rejoice over a windfall gain they are set to make. To overcome the shortfall in pulse production this year, the Indian government has decided to import 5,000 tonnes of pigeon pea (arhar daal) from Malawi. These developments raise many questions over the farming of pulses in India, which has emerged as the most politically sensitive crop in recent times. And not without reasons. Around the time the National Democratic Alliance (NDA) government was celebrating near zero food inflation in its first year in power, consumers across the country felt the pinch of food inflation again. Within a span of one month (May) it rose from 4.8 per cent to 5.48 per cent. 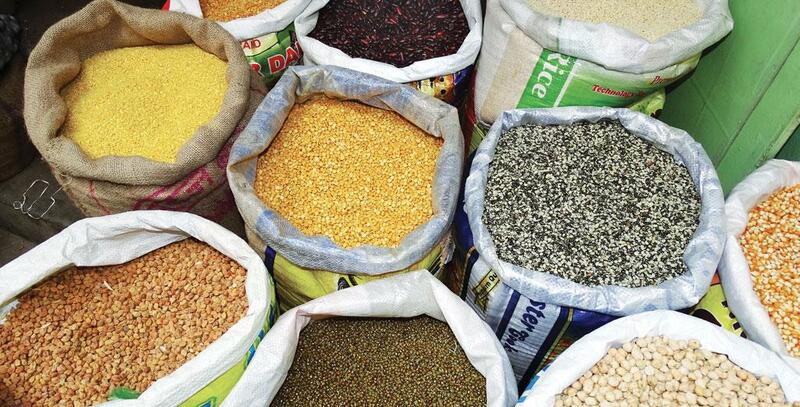 In fact, retail prices of pulses have risen by up to 64 per cent in the last one year across the country. The major driver of food inflation was the hike in prices of pulses, which was caused by the crop loss due to untimely rains. India’s pulses production fell from 19.25 million tonnes in 2013-14 to 17.3 million tonnes in 2014-15, while imports rose from 3.18 million tonnes in 2013-14 to 4.58 million tonnes in 2014-15. But will farmers like Rani Devi heed to Modi’s call? 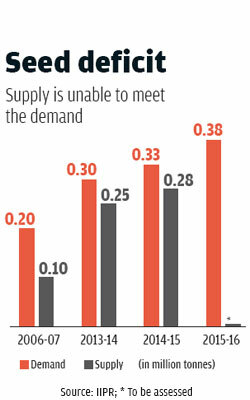 There is a huge gap in demand and supply and the market prices are lucrative. As per estimates made by the Union Ministry of Agriculture, the country requires to produce 28 million tonnes of pulses by 2021 to become self-sufficient. “India needs to grow pulses on an additional 6-7 million hectares (ha) to meet its targets,” says Raghvan Sampatkumar, a Singapore-based pulse trade expert. To meet this target there is a need to improve the yield to 1,100 kg/ha from the current 760 kg/ha. But farmers say they are not prepared to start farming pulses just yet. The reasons are many and they highlight the sorry state of pulse farming in India. India has not been able see a net increase in land under pulses cultivation since the 1960s. Though land under pulses cultivation has seen an increase in southern and central India, the gains made have been neutralised by the loss in cultivated area in the Indo-Gangetic belt (see ‘Shifting cultivation’). As a result pulse production did not see a major boost for a large part of the past 60 years. Between 1970 and 2008, the production of pulses stagnated at 12-14 million tonnes. The per capita availability of pulses reduced from 61 g to 37 g in the past 60 years. The scenario has improved a little in the past few years. The production of pulses has risen from 14.5 million tonnes in 2008-09 to 19.25 in 2013-14, primarily due to the government’s efforts to strengthen seed production and distribution, and the continuous increase of minimum support price. But this spurt in pulse production is not enough to meet the demand as the import of pulses has also seen a rise. In 2014-15, India imported 4.58 million tonnes of pulses, against 3.18 million tonnes imported in 2013-14. 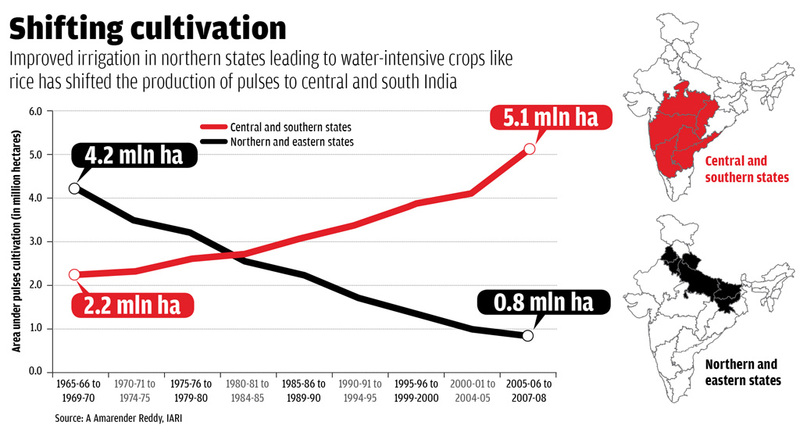 The reason behind the decline in pulses production in the northern states is improved irrigation facilities, which allowed these states to grow water-intensive crops, such as rice and wheat. These crops also give assured returns because they are procured by the government. Southern states, which were mostly rain-fed and where irrigation facilities are not good, started growing pulses. Development of heat-tolerant varieties, such as JG11 (a chickpea variety), also helped. “JG-11 had changed the landscape of pulses production in south India,” says A Amarender Reddy, principal scientist, Indian Agricultural Research Institute (IARI). Another reason behind this shift from north to south was a pest. “The attack of pod borer pest is frequent in the Indo-Gangetic plain and causes major losses. Scientists are still trying to find a way to deal with it,” says C Bharadwaj, scientist at IARI’s Pulse Research Centre. Increasing production of pulses in the country can happen either by increasing land under pulses cultivation or by using better quality seeds. But there are major structural issues and demand-supply gaps (see ‘Seed deficit’). The problem begins with the assessment of seeds required by the states. This is done at the panchayat level by an agriculture officer. But their assessments are mostly a rehash of the assessments done in previous years. So on the basis of these incorrect assessments, the states place their orders with the National Seeds Corporation of India (NSCI). When farmers are supplied with seed varieties they don’t wish to grow, they resort to sowing seeds they had saved from previous year’s yield. Studies say that new seeds should be sown every three years or the yield goes down. This seed replacement ratio (SRR) in the country is currently more than five years. “These assessments are made three years in advance. For instance, the assessment for 2019 will be made in 2016. States need to stick to their plans to get a good produce,” says S S Singh, head of Crop Improvement Division at the Indian Institute of Pulses Research (IIPR). There is another major reason—centralised seed production. States in India had their own seed farms catering to regional demands. But these were making losses and were merged with NSCI in 2013, which now supplies seeds to all the states in the country. Experts say that though seed production has increased threefold in the past eight years, there still is a shortage of 50,000 tonnes of seeds. Sanjeev Gupta, director, National Project on Pulses Seeds, IIPR, says that only a decentralised model of seed production is suited for a country as large and climatically diverse as India. But all hope is not lost. India can substantially increase its area under pulses and across the country. Experts say that between the rabi and kharif seasons there is a window of opportunity (October-December) to cultivate short-duration pulses. “India has 6.7 million ha of rice fallow land (land that has been left uncultivated after the rabi crop of rice) which can be used to grow pulses. This is already being done in West Bengal, where chickpea and lentils are being grown. We need more short-duration varieties,” says Bharadwaj. S N Pandey, former scientist who works with Delhi-based non-profit Development Alternatives, says that the market supply chain of pulses is quite long and unorganised—farmer to small traders, commission agents, wholesale dealers and retailers before reaching consumers. “In this process, the profit margin of farmers shrinks. This needs to be looked into,” he adds. Apart from a long supply chain, Reddy raises another important issue. He says that in the past three years, the government has been ordering import of pulses in the months of July and August. The delivery takes around three-four months. When the imports arrive in November-December, the market is already flooded with pulses produced domestically. This brings down the prices and the farmers suffer. If we face crop losses in March-April, like it happened this year, the import order should be placed immediately after the loss. “If the government does not devise a proper strategy, farmers will shift to other crops. This is already happening in Andhra Pradesh, where farmers growing chickpea have shifted to cotton farming,” says Reddy. Very confusing analysis as not going deep into the reasons for the southward shift in area under pulses. However this article is the best example of showing camouflaging grassroots realities under the aggregation and averages- the standard deception techniques employed by generalists. Interesting to see how capriciously avoided any mention of national food security mission (NFSM) on pulses during the Eleventh Plan period. The fact that comes out very strongly is the confusion prevailing at the scientists level as their inability to set a proper agenda for pulse research given the rich field experiences. The question requiring a detailed analysis is: who sets the pulse research agenda. At the price front again the vagueness gets submerged under the cheerleaders cacophony for privatisation. These cheerleaders are trying to find a fig leaf to hide their remotely contrived obsession either to 'get the prices right' or 'get the markets right' spins of the last decade. Beneath these cacophony is the inefficiency of NAFED. Pl recall proactive their verbal diarrhea during the Onion price imbroglio.